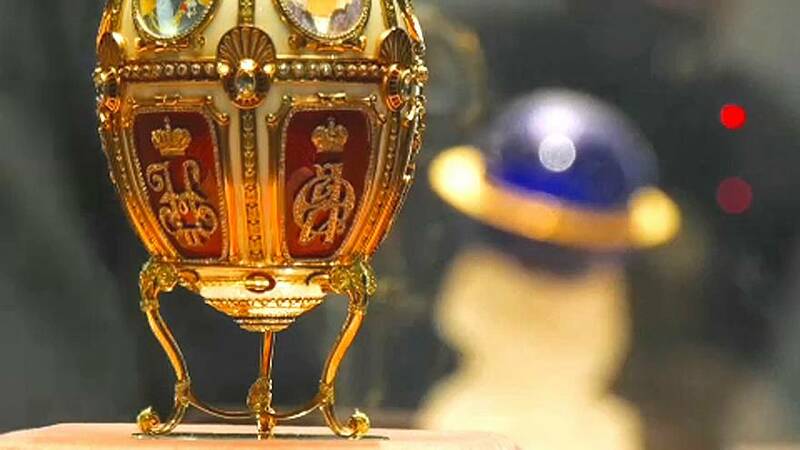 Russian artist Carl Fabergé is synonymous with the bejewelled eggs he made for the Romanov imperial family in the early 1900s. He was the owner of the largest jewellery company in Russia at the time. Now some of his most famous works are being exhibited at the New Jerusalem Museum, northwest of Moscow. The display includes an egg designed for the 10th wedding anniversary of Nicholas II and his wife Alexandra. It's made of gold, diamonds, coloured enamel, velvet and ivory. Also on show, the Imperial Blue Tsarevich's Constellation egg, made in 1917, of gold, diamonds, rock crystal, glass and jade. With such priceless treasures on display, nothing is left to chance. "Of course, the security is high-level: an alarm system, special glass, extra guards. Everything on display is under surveillance," Vasily Kuznetsov, general manager of the New Jerusalem Museum said. These precious products were the major source of income for Faberge in Russia in the late 19th century-early 20th century. They were often given as presents by those who could afford such generosity.